This card is so beautiful. I took a picture of it while I was having lunch one afternoon. One of the best things about swapping is all the ideas you receive. As a good stamper, I love to CASE cards. (Case stands for COPY ANYTHING STAMP EVERYTHING!) This is a great case card. 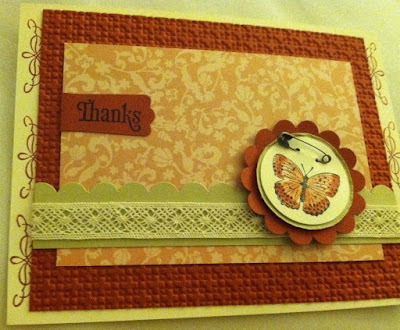 The colors are my favorite and the card is very simple to make. This is a swap that my roommate Jessi created. It's this beautiful. She is a wonderful artist. I love the colors. Her cards are very sweet and clean. I encourage all of you to buy handmade card. They are made with love, sweat, and inspiration. Think about putting that out into the world where people are receiving love. Reminder that there are two more days for becoming a demonstrator and receiving your kit for $99. 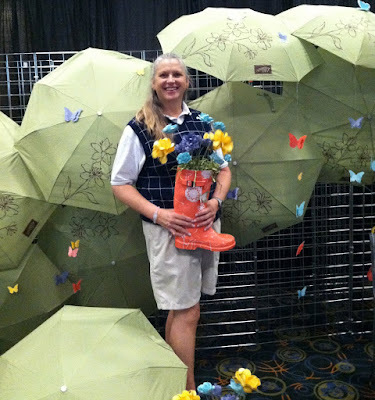 Here I am in the Memento mall enjoying being away from the rain we are having this summer. Salt Lake was fabulous due to the fact it was warm! I am hoping that the sun is coming out for more than 2 days in a row! 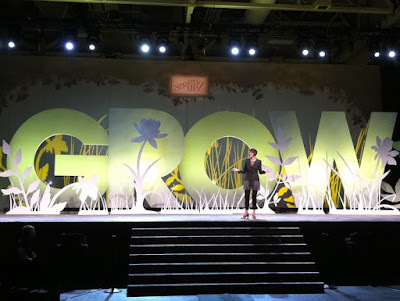 This is one of the decoration they had in the hallways encouraging us to grow our business. I also thought it was important to take a good look within and do some spiritual growing. This is one of the nicest cards I saw at convention. 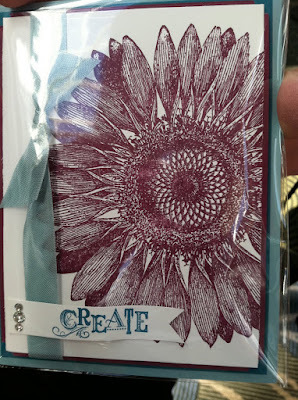 I LOVE, I MEAN I LOVE this sunflower stamp. The artist did an awesome job! 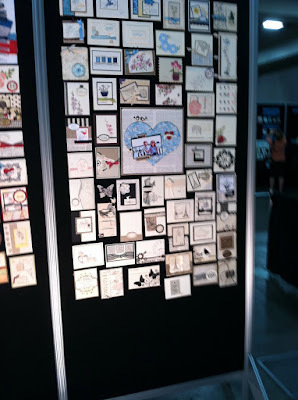 Here are a couple of bulletin board with cards and scrapbook pages on them. 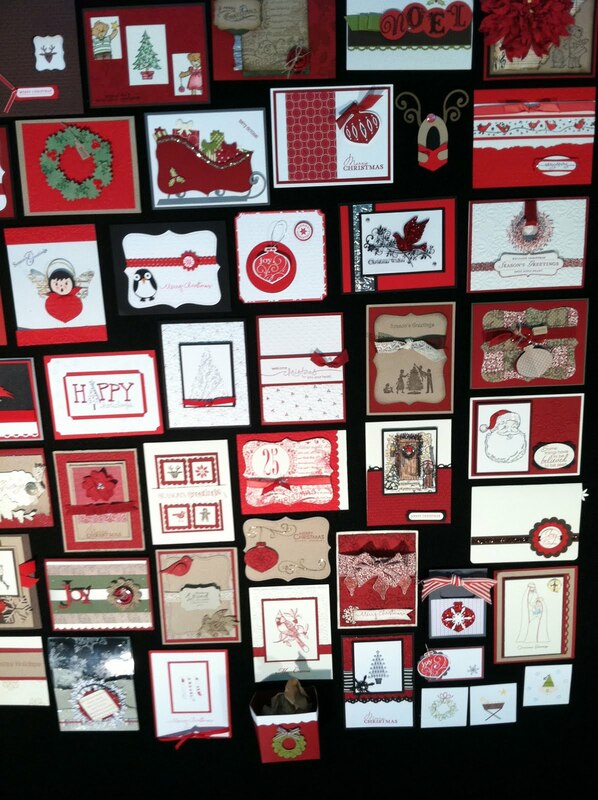 It is so amazing taking pictures of all these bulletin board filled with cards. You have so much respect for all the creators. It is really incredible to be around so much creative energy...I realize, this is what I want to do. 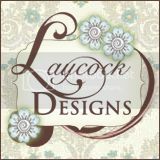 Creating cards gives me a sense of peace within, a desire to create wonderful cards, and to encourage others to buy handmade cards! How Would You Like a Big Shot for Half Price?!!! Plus Free Dies?!! You must be asking yourself, "How could this be possible?" 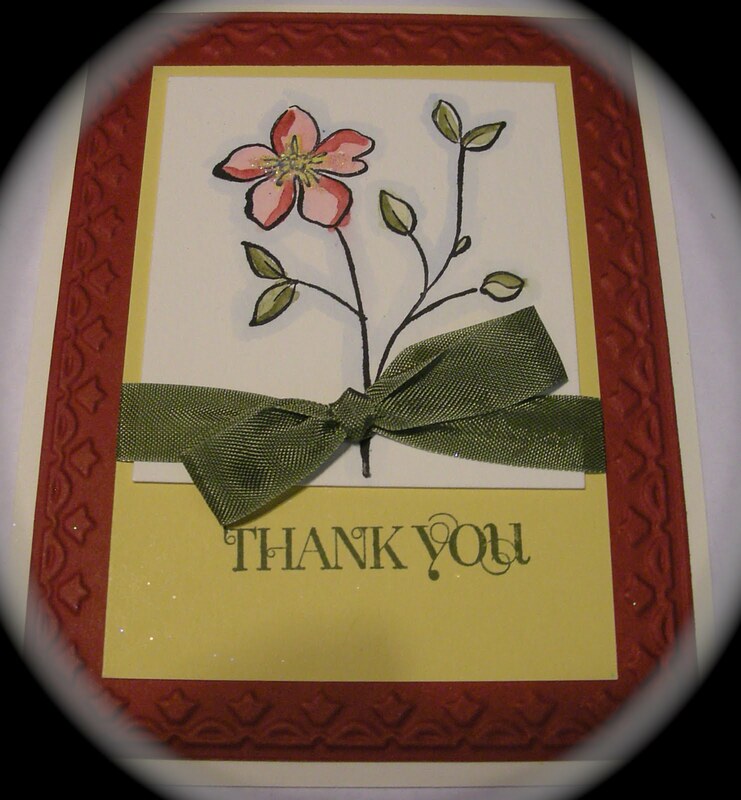 Here's how: With Stampin' Up! 's new Hostess Benefits, all you have to do is put together a $400 merchandise order, and this package is yours for only $49.98! You can't afford a $400 order? 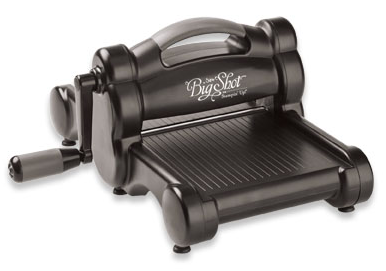 No problem, hold a workshop or private party, or gather orders from your stamping buddies, and if you and your friends' orders add up to $400, then you earn the Big Shot package! How is that possible? For the very first time, Stampin' Up! is offering half-off merchandise for orders of $400 or more. Plus you get $65 Hostess Dollars to spend on anything you want. Which is how you can get this package for only $49.98! 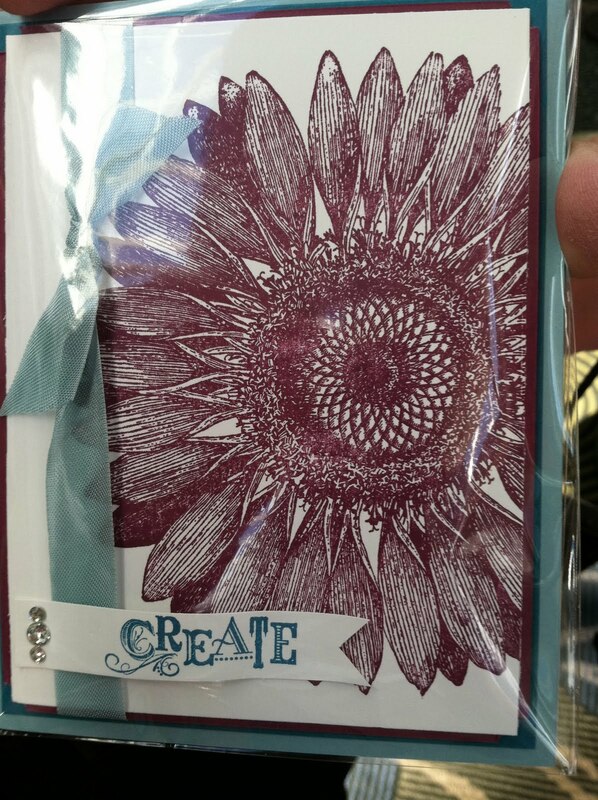 What if you don't want the dies and embossing folders I listed? No problem! Substitute the ones you want in any combination that adds up to $65. Could it get any better than that? You bet it could!!! The bigger the order, the more half-off items and Hostess Dollars you earn! If you have been wishing for a chance to add some great new merchandise to your craft room, here is the opportunity you have been waiting for! Please email me or press here for my on-line store. I can’t believe I am in Salt Lake City for the SU convention. I have been working hard to get all my swaps finished! The next few days I will be showing you my swaps and other swaps I received from this wonderful event. This is a great place to spend time with like minded woman and men. You just talk, dream, share, swap, and create. It is nothing but a love fest about rubber stamping, wonderful cards, networking, and dreaming of your next project. Sleep isn’t a big priority! Gotta love a big slumber party! 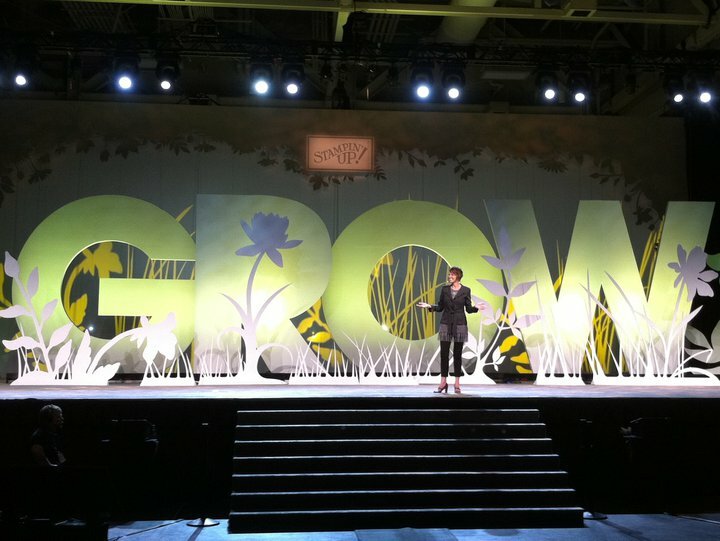 This is the main stage at convention...it's it beautiful. 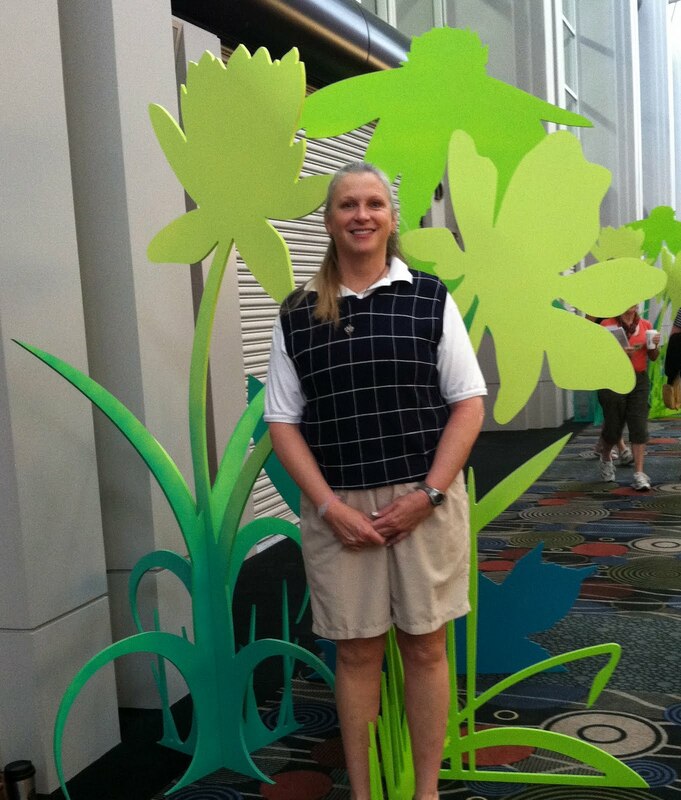 Shelli is on stage looking so cute...OMG, to wear an outfit like that and be a Grandmother! Here are two swaps I made. They were easy and turned out quite nice. I am having a blast...my roommate is from Utah. She is cute as a button. (waiting for my phone to send me the picture so I can share her with you. We both walked across the stage, for the first time. Jessie because this is her first convention and me for my recruit. It was so much fun and OMG the light are soooo bright! 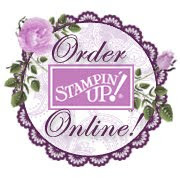 Have you ever thought about joining Stampin' Up!? Were you once a demonstrator--and miss it? As well as 8 Catalogs (to share with your friends!) and other business supplies! 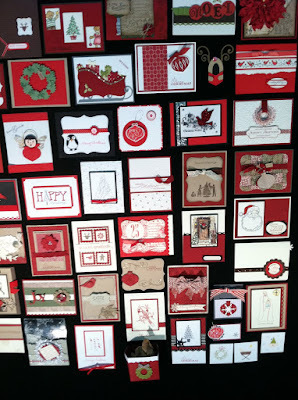 Plus, when you join in July, you will get a Christmas Keepsake project kit absolutely FREE--a $40 value! This exclusive kit contains everything you need to create a beautiful Christmas Keepsake Box to hold your most treasured Christmas memories. Remember, you can only earn this special Shelli Signature Collection kit when you join in July! TOTAL VALUE OVER $225 AND YOU GET FREE SHIPPING!!!! • Access to exclusive "huge" demonstrator only website--lot's & lot's of ideas! Past Demonstrators--it's time to come back! • Lot's has changed--check us out! JOIN TODAY--THIS GREAT DEAL ENDS JULY 31ST!